Bust of Michael Faraday with head turned to the left as viewed. In classical style with draped shoulders. On a round marble socle. Michael Faraday (1791-1867) was a British chemist and physicist, he was elected a Fellow of the Royal Society in 1824. Provenance: Presented by H Bence Jones, FRS, 1873. The donation is recorded in the Royal Society’s Council Minutes: ‘Read the following Letter from Dr. H. Bence Jones, F.R.S. 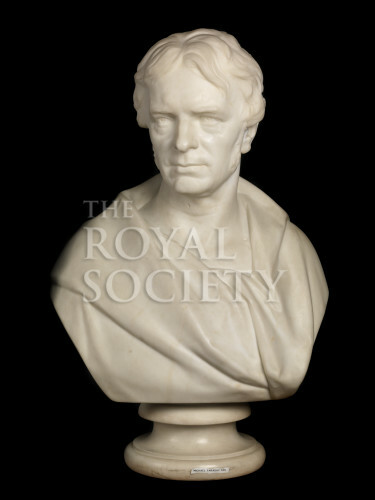 :- 84 Brook Street, March 18, 1873 GENTLEMEN, -- I have requested Mr. Foley, the sculptor, to forward to you my marble bust of Mr. Faraday. It was made by Mr. Noble when he was commissioned by Mr. Walker, the engineer, to sculpt Mr. Faraday. This copy came into my possession, and I beg to offer it for the acceptance of the Royal Society. Mr Walker at his death bequeathed his copy to the Royal Institution. It will give me much pleasure if the President and Council will receive mine. I am , Gentlemen, Your obedient Servant, H. BENCE JONES. Resolved, -- That the cordial thanks of the President and Council be returned to Dr. Bence Jones for his valuable gift.’ Royal Society Minutes of Council, Printed, v.4 1870-77, meeting 20 March 1873, p.168.